Roman involvement in Iberia began during the Second Punic War. Hannibal's attack on the Iberian city of Saguntum gave Rome the pretext to declare war on Carthage. Rome's eventual victory gave them control of all of the Carthaginian territory in Iberia. Rome's subsequent expansion in the Iberian Peninsula was met by fierce resistance from the native Iberian tribes. It was not until the reign of Augustus that the entire peninsula was brought under Roman Rule. Hispania rose to become one of the most important regions in the Roman Empire. Many of the peninsula's population were admitted into the Roman aristocratic class and they participated in governing Hispania and the Roman empire. The latifundia (sing., latifundium), large estates controlled by the aristocracy, were superimposed on the existing Iberian landholding system. 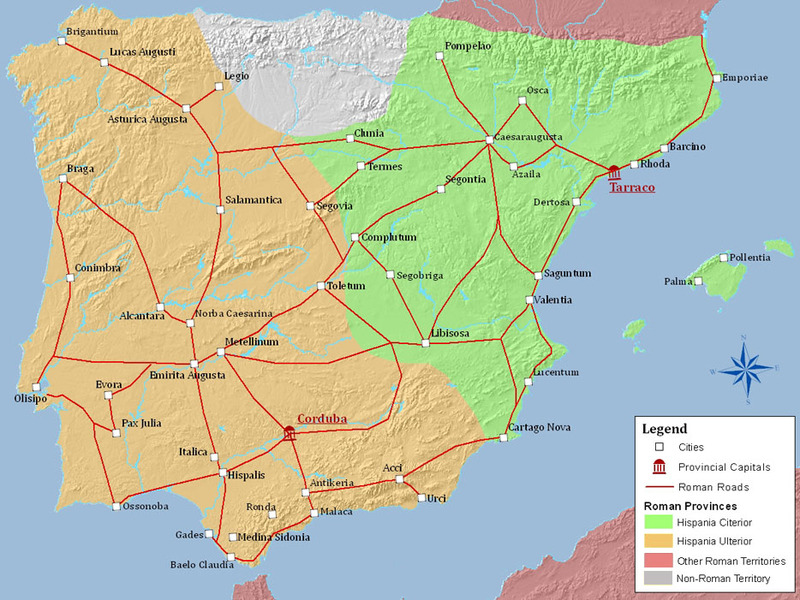 The Romans improved existing cities, such as Lisbon (Olissipo) and Tarragona (Tarraco), established Zaragoza (Caesaraugusta), Mérida (Augusta Emerita), and Valencia (Valentia), and provided amenities throughout the empire. The peninsula's economy expanded under Roman tutelage. Hispania served as a granary and a major source of metals for the Roman market, and its harbors exported gold, tin, silver, lead, wool, wheat, olive oil, wine, fish, and garum . Agricultural production increased with the introduction of irrigation projects, some of which remain in use today. The romanized Iberian populations and the Iberian-born descendants of Roman soldiers and colonists - had all achieved the status of full Roman citizenship by the end of the 1st century. The emperors Trajan (r. 98-117), Hadrian (r. 117-38), and Marcus Aurelius (r. 161-80) were born in Hispania. Roman rule in Hispania ended during the collapse of the Western Roman Empire to the invasion of various Germanic tribes. The Visigoths were the tribe that came to dominate Hispania.